Apache and mysql are installed by default in Kali Linux. They can be accessed through the Kali Linux menu in Applications. To start apache web server click the menu entry at "Applications > Kali Linux > System Services > HTTP > apache2 start". 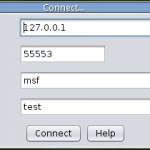 Similary to start mysql click MySQL > mysql start. However starting services manually everytime is a waste of time and its better to get them to start automatically at boot. To configure services like apache, mysql etc to start automatically at bootup just execute the following simple commands. The following command will configure apache to start at bootup. The following command will configure mysql to start at bootup. Postgresql is used by metasploit for caching data. Therefore its better to get it started at bootup as well. Command is similar to the above ones. Tor, the great anonymity network is also a must for hackers. So it should always be at service when you are hacking inside Kali. The configuration is now done. Now reboot kali. After it boots up, check the status of the services by running the following commands. Apache2 is running (pid 2072). So all services should startup themselves at boot up. If there are any more services you need to startup, configure them using the update-rc.d command, and they should work. i get the error “sh: 1: service: not found”, but if i run mysql -u root from the terminal it works. Can anybody explain this to me?